Been dreaming about MAGALAWA ISLAND since last year and finally we had our chance last week. Armada resort offers an all-in package of Php1,400 per person. That package includes over night stay in the island with 2-way boat ride, entrance fee, nipa hut good for 6 persons, meals (lunch upon arrival, dinner, breakfast and lunch before departure) and snorkeling. Not bad right? It's a 4-5 hour drive to Palauig, Zambales and from there, a boat ride going to the island. We choose to park at Palauig because the boat ride from there is shorter. We arrived around 2pm and our lunch was waiting for us. We settled down and checked the place. Our beach front nipa hut was cool. We got into our swim wear and checked the beach. Thanks to my sister for lending us her Lumix. We did capture a lot of precious moments hehehe. And good thing my underwater camera is still working. Dinner was awesome. They served seafoods, unlimited rice plus soda and dessert. Solb talaga. They sell cold drinks and beer to complete that night of relaxing beside the beach. They do not allow load music and partying at night. In respect to visitors who wants to sleep and relax. The next day, breakfast were served--hotdogs, embotido and eggs with fried rice and coffee. Sorry I didn't took pictures hehehe. Then we checked the beach again waited for our 8AM snorkeling appointment. So proud of the kiddo coz she was not afraid. She definitely enjoyed the snorkeling part. Careful with the current though, it's quite strong from time to time. I had a hard time, swimming-while-holding the kiddo-with a camera. So please be careful! I didn't spend that much time underwater because I was busy watching the kiddo. But of course I took a glimpse on what's under water and it was amazing. Then we head back to the beach where we spend quality fun time. I super love the water and sand. Water was so clear, I can still see my foot even with the water up to my chin. Hubby and the kiddo spend time in the shore playing with some star fish and shells. Me, I prefer to be in the water and swam a lot. We took a bath around 11am and had our lunch. We packed our bags and waited for our boat. And while waiting---picture picture! It was hot that day and my skin was already burned but still I insist to go to tip of the island for picture taking hehehe. They don't allow guests to swim in this area because the current is stronger here. Notice the color of the water--it's darker just a few meters away which is very deep. At mawawala ba naman ang aking solo jump shot? Syempre hindi hehehe! Super init nun pero okay lang. Mejo creepy lang sa dulo ng island. Walang alon pero kitang-kita ang current. Katakot db. We're planning another wedding! Yup yup yup! It's confirmed. Sister S and J's wedding will take in a few months and paper works are already in the works. This will be something different for us because it's an out of town wedding, plus we have balik-bayan guest coming from different country and different races hehehe. It's gonna be a simple civil wedding with a touch of traditional wedding. My sister already emailed us overloading information and hopefully everything will be done before the big day. It's time to shop for bridesmaid dress again! I've been spending more time on the Internet scouting for that perfect bridesmaid. And I think I'd go for bill levkoff bridesmaid dress style 152. I very much like that simple top and the skirt cut. Of course, the color will be different and sort match the wedding theme. I hope my sister approves. I know everybody's been dreaming of that perfect flawless white skin. I know, because it's been my dream since I was a teenager. I tried so many products in the market that I already lost count. Whenever we see someone with fair and white skin, I always end up wondering... What's her secret? Lille did I know, it wasn't a secret because it's out in market. It was just under my nose and I didn't even noticed it until my friend actually recommended it to me. SkinWhite. So here's the big question... How does SkinWhite give you that beautiful blush white skin that your prince charming can’t resist? Here's why---with SkinWhite you can get SYNCHROWHITE ACTION that works FOUR ways at the same time, all the time, every time! ...first, it WHITENS the skin's surface: who wouldn't right? ...second, it REDUCES formation of new dark pigments at it's source: which by the way is very hard to achieve with an ordinary whitening cream. ...third, it NOURISHES skin with Vitamins. Even the body needs nutrition right. ...fourth, it PROTECTS skin against toxins and UV rays. We often skip this part which is the most important. ~Click *here * to know more about Synchrowhite Action from Kim Chiu. So by using SkinWhite, I'll get all these and be the fairest of them all. You too can be one! You may cast up to 50 single votes online, after which any votes cast will not be counted. I have 2 projects coming up in a few weeks and I'm soo looking forward to it. First is our account's Anniversary party this coming June. 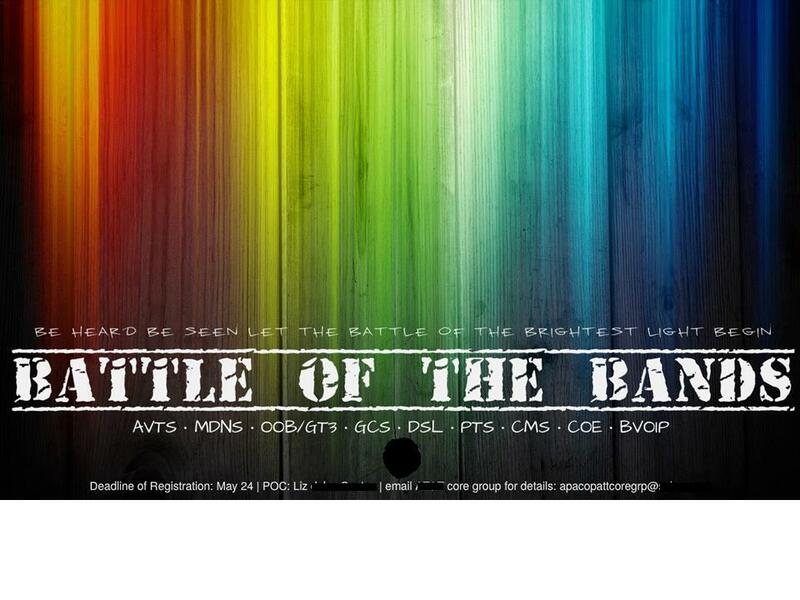 I will be organizing the party's Battle of the Bands part. 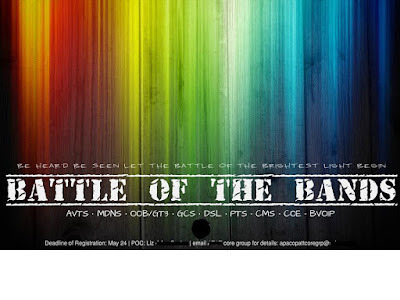 From the mechanics to the band group and equipment. Adverts are already out via email and posters and I'm so kilig to see my name in it hahaha! 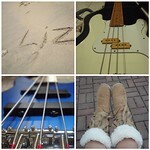 This has been my passion--MUSIC. Maybe I should an event organizer don't you think? Anyway, here's the poster. 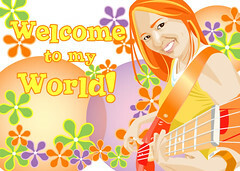 Currently we have 2 bands registered, and I'm included in one of the bands too. 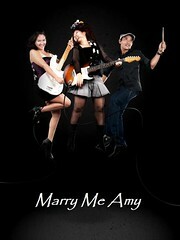 I know I should have not join but we had musician shortage recently due to unavoidable events. However, we're still glad the management still supports and keeps the music alive every year. Second is the Band Project. I've hand-picked these guys to play for a friend's wedding in August. We already met and had our first jam last Friday and so far so good. More practice needed I know but if this goes well... We'll probably go for originals. I'm having good vibes so it's a very good sign! 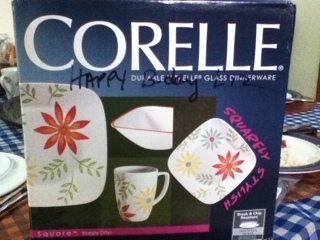 We received another 'balik-bayan box' today and this time with my gift inside--Corelle set. Super thanks to my MIL! I know it's 3 months late but it's better late than never hahaha. And I'm lucky to get another gift even after 3 months right. Anyway, we also got a digital frame, few clothes for the kiddo and chocolates of course! But me, I got my eye on my prize. 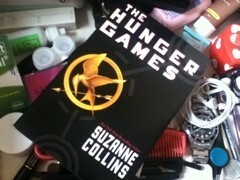 Haven't opened it yet though because I just wanna look at it for now hahaha. Belated Happy Birthday to me! Yey! School time once again. Can't believe the kiddo's gonna go to a bigger school already. Time flies so fast. As in super fast huhuhu. Got everything ready (almost I think). Bag, uniform, shoes books and school supplies. I still need to put cover on all the books and that's pretty much it. My sister and I talked about getting a home pc where everyone can use and I plan to get with a printer with extra canon ink cartridges, perfect before school starts. I know the kiddo will use it for assignments and projects. We're definitely ready. Grade one, bring it on! My days are busy and productive ever since we moved. Of course, house sorting is still not finish. Then I started to jog and exercised from our day one here and that took away my time in the kitchen, but it's okay because I know I'll have time for that soon. Now I started to play and God it feels good. I know I'll be spending more time with the band again due to up coming projects and I'm so excited. And there's another passion of mine--Reading. 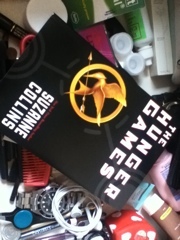 My sister lend me this book and said, "It's a must read!" Good thing I haven't watched the movie yet because I prefer to read the story before hand. 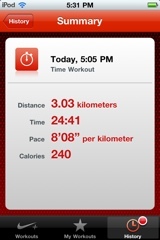 I started to cut down my jogging time to half because I plan to spend the other half with the mini-gym. And so I set the timer to 20 minutes in the treadmill and I was surprised to finish close to 3k at the end of my workout. Muscles now ache and I'm loving it. Some 160 billion emails are sent daily – more than 2 million per second – by 1,2 billion email senders. 97% of it is spam. Yup! We watched Avengers for the second time and with my sisters this time. I just want to stare at Captain America and Thor! Handsomeness to the highest level lol! Fight scenes still rocks! Anyway, it's my first weekend off for this month and I'm having a blast already. Thank you Lord. We just moved to the new house already and we're been very very VERY busy fixing/settling down. But it still feels like there's nothing to do when there's no Internet connection in the house.We all feel isolate and far from the world. My sister and I agreed to get a new ISP, since they disconnected the previous account. First we wanted Sky cable. I called Sky but the lady said, they haven't installed a line yet in our area, thus leading us to options--pldt or bayantel. I already scarped out SmartBro from our list due to my bad experience with them for the past 2 years. Their 'wireless lan' connection to the nearest cell site tends to experience congestion due to numerous users, especially during peaks hours. Adding up was the cell site maintenance etc. Anyway, my sister called pldt to get the 999 plan. Unfortunately, it's only for clients with existing pldt phone lines, which means we have to get the 1299 plans instead, which includes DSL + Landline.To bad for them, we don't need land line haha. So we were down to bayantel. We already had 2 previous accounts with bayantel (from our previous addresses) and so far, connection was okay. My sister's latest experience with bayantel is when it rains, DSL disconnects, so she needs to call me for support. Since we're living together now, tech support is here hahaha. My conclusion was their wireless router on that issue btw. I'm expecting a call from bayantel later today for the installation since I registered online yesterday afternoon. I'm all out excited on setting up the wireless connection at home because this is going to be permanent. Internet connection is a MUST for us. Even the kiddo complains when youtube is not acccessible LOL.